SAN FRANCISCO TRAMS IN WW2. A scene on San Francisco’s Market Street in 1943. Tramcar 103 is picking up passengers before turning off onto Duboce Avenue prior to entering the 4,642-long Sunset Tunnel and heading east to Judah. San Francisco is unusual in that its tram routes are distinguished by letters rather than numbers; this car is on route N.
The tramcar was built in 1914 by Jewett Car Co of Ohio for San Francisco Municipal Railway and had seating for fifty people. It was part of an order for 125 cars to expand the Municipal Railway (‘Muni’) service for the Panama-Pacific International Exposition in the Marina District. During the Second World War the San Francisco tram livery was royal blue panels with gold window frames. A mock up of a tram with the same number is now part of an exhibit in the San Francisco Railway Museum in Market Street, although the original tramcar 103 was probably scrapped in the 1950s as the entire electric tramcar fleet was replaced by PCC cars by 1958. Only numbers 130 and 162 of the 125 cars are thought still to exist. Both are operating on San Francisco’s historic F line service, which uses vintage tramcars, including Blackpool ‘boat’ 228. The F line runs along the same part of Market Street as the section of the N route shown in the photograph. 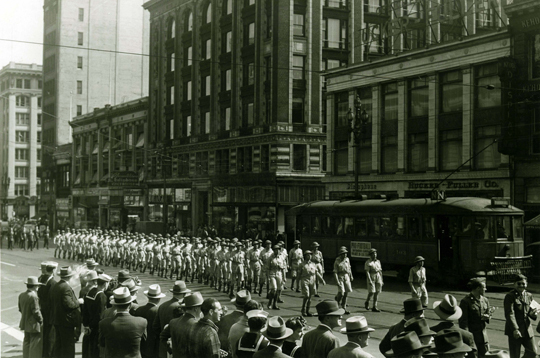 ‘The parade went well but we had to break line to pass a tram, or streetcar as they say over here.